Get hooked on fishing Saturday, Oct. 29 at a free tournament that's just for kids. 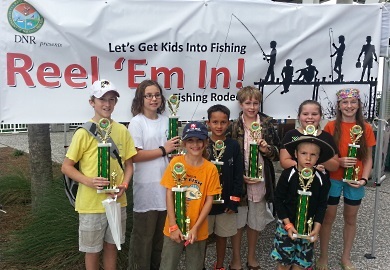 The S.C. Department of Natural Resources (SCDNR) invites you and the 16-and-under anglers you know to the third annual Reel 'Em In fishing tournament at the Mount Pleasant Pier in Charleston. The tournament will run from 8 a.m. to 1 p.m., rain or shine, and prizes will be awarded in several categories, including for biggest fish caught, most unusual catch, and most fish caught by an individual angler. "The 'Reel 'Em In' tournament is aimed at getting kids into saltwater fishing and provides a great opportunity for adults and kids to share the angling experience and enjoy the outdoors," said Robert Wiggers, coordinator of SCDNR's marine game fish tagging program. At the second tournament in September 2015, 40 youth anglers reeled in a total of 90 fish, representing 19 different species. Anglers Noah Cannady and Samantha Kotz each took home a Big Fish Award for their winning catches, a 1.6-lb black drum and a 0.8-lb sheepshead, respectively. The Most Unusual Catch went to Rachel Lingerfelt for a juvenile cobia, from which a DNA sample was collected for SCDNR research. Mason Cavallon took first place for catching the most fish of the tournament (12). A number of first-time anglers also reeled in their first fish, including Isabella Reamer, who hooked a 12-inch bluefish with a little coaching from SCDNR staff and her father, Mark Reamer. No rod and reel? No problem. SCDNR staff will have loaner fishing rods and reels—just arrive early, because supplies are limited. Tackle and bait will also be provided. Please note: participating anglers must be 16 or under and accompanied by an adult in order to take part in the tournament. Please pre-register at https://www.surveymonkey.com/r/REITournament. Fishing licenses are not required for anyone participating in this event. The Mount Pleasant Pier is located in the shadow of the Arthur Ravenel Jr. Bridge at 711 Harry Hallman Blvd., Mount Pleasant, SC. For more information about the location, please visit the Charleston County Park and Recreation Commission webpage. For more information about the tournament, contact Robert Wiggers at WiggersR@dnr.sc.gov or (843) 953-9363.